Madison and I are back from our adventure in Washington state! We had such a great time! The weather was beautiful, and we got to do lots of new things! We arrived into SeaTac airport rather late - 10pm Seattle time - which means our bodies thought it was 1am! I definitely made a wise choice by staying at a hotel near the airport that first night instead of driving to Mt. Rainier. We got our rental car and made our way to our hotel in Auburn, WA. That was our first adventure! Madison has a good gps on her phone, so I didn't bother bringing any directions with me...NOT A GOOD IDEA! The phone gps did not want to work in WA, so we had no idea where to go. She did have written directions on the phone, but we couldn't find the road we needed - of course! We ended up in a Subway parking lot and we were lucky there was also a police car in that lot, so Mads went inside and asked the officer where we needed to go. YAY! We were on the road to the hotel when we got lucky again! The gps decided to start working! We made it to the hotel and settled in for the night - we were exhausted! The next morning we decided to find a Wal-mart to get some snacks before we headed to the mountains - again with no directions (so unlike me!). The gps took us to the 'SuperMall' and we picked up some trail mix, chex mix, and lots of water for hiking. The 'SuperMall' really wasn't all that super as far as malls go, but they had this really cheesey looking sign which ended up being perfect for a 'Mads on Things' photo. Fun times! Now we were ready to head to Mt. Rainier. It was a bit of a drive and with all the beautiful scenery it took even longer. These Florida girls are not used to seeing such mesmerizing sights! Our first stop was Crystal Mountain to brave the gondola ride to the top! The new Doppelmayr gondola travels almost 2,500 vertical feet from the base of Crystal to the top of the mountain. The view was spectacular on the ride, but did not prepare us for the majestic view at the top of that mountain. We feel so fortunate! Thank you allrecipes.com for making this trip possible! No standing in the gondola! After the gondola we drove to the Sunrise Visitor's Center which is the highest point in Mt. Rainier National Park that you can go in your car! When we got to the visitor's center we were, again, mesmermized by the views! Mt. Rainier is even closer from this vantage point - it felt like we could reach out and touch it! We browsed around the visitor's center for a bit until we decided which hikes we wanted to tackle, then we set out on our first hike to Frozen Lake via the Sourdough trail. This was a moderately difficult hike spanning 3 miles and gaining 400 feet in elevation. The views were stunning! The trail got very rocky! The trail ended up being covered in snow. We could have climbed over the snow like so many others did, but being from FL we are very inexperienced with snow and it was a long way down if you slipped! We chose to live! We still had time to explore, so we went on another hike. This time we went for a bit of an easier hike. That first hike was an eye opener for me! I definitely need to work on my cardio! The Sunrise Rim Trail to Shadow Lake was a little more than a 2 mile loop with an elevation climb of only 200 ft. We had a difficult time just trying to find the trailhead, and ultimately we unknowingly started at the end of this trail (which explains why everyone we passed along the trail was going the other way!) 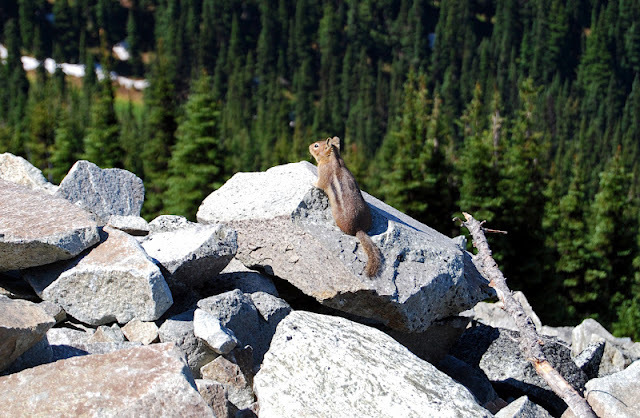 It worked out for us though - we came upon this cute little guy (I believe he is a marmot). He sure was curious about us! He seemed to be posing for the camera - we spent a lot of time with him, and Madison named him Herbert! He's sticking his tongue out at us! Shadow Lake - this is the lake we looked down on from the Frozen Lake trail - it was hard to believe we had just been high up on the ridge! It was starting to get late and we needed to make our way to the Paradise side of the park to check into our accommodations for the night. We stayed at the Paradise Inn - it was truly a beautiful location! So great what an awesome blog and even better time. Thanks, Joey! It was great meeting you! !